Lacerations are among the most common non-fatal workplace injuries and they afflict injury victims outside of the workplace as well. Though they make up a large proportion of non-fatal injuries, lacerations can still be serious or even fatal. When lacerations are the result of personal injury, such as an auto accident, a defect on someone else’s property, or an accident involving factory equipment, the law permits the victim to recover for the loss. 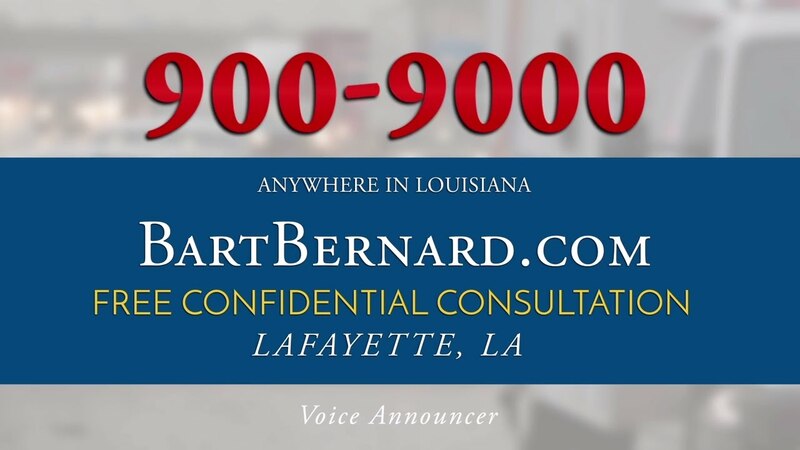 The Bart Bernard Injury Firm fights aggressively for personal injury victims in Lafayette, Louisiana and Baton Rouge, seeing the big picture while understanding the details of what clients are going through. “Laceration” is the medical term for a cut. They often occur alongside “contusions”, a medical term meaning bruises. In personal injury and workplace accident cases, cuts and lacerations are a common injury but that does not mean they are trivial. A laceration involves an irregular tearing of the skin and can be the result of an encounter with a sharp object or even by blunt force impact. In many cases, lacerations are minimal and require only standard cleaning and a medical check to ward off infection. But in some cases, the physical damage can be severe, extending through the skin into the tissues or bones below. In these cases, organ, muscle, and bone damage, as well as excessive bleeding and pain, are concerns. In addition to basic first aid, when someone suffers from lacerations they may also require serious medical intervention. This can include amputation of a severely injured limb, plastic surgery to minimize scarring, and even complex surgeries to repair punctured tissues. No matter where the wound occurs, it is important to treat it as if it may become infected. Call 911 if the cut is bleeding severely, will not stop bleeding after pressure is applied for 10 minutes, or if it is spurting blood. The area should be cleaned with warm water and a mild soap, but not with alcohol or peroxide, which can overly dry the wound and prevent healing. Apply an antibiotic and cover with a sterile bandage. Seek medical attention if the cut is deep or will not wash clean, if it is over a joint, if the cut is from a bite (whether it is from a human or an animal), or if the the wound is deep and the victim has not had a recent tetanus shot. Watch for signs of infection, including excessive pain, redness, warmth, swelling, or pus. Bart Bernard helps personal injury victims make sure they have the financial means to benefit from these necessary medical treatments by holding at-fault parties responsible. When is a laceration injury most common? According to the Occupational Safety and Health Administration, 9.6 out of 10,000 full-time workers in 2015 suffered from injuries related to cuts, lacerations, or punctures. This number was up from the 8.8 per 10,000 workers suffering lacerations and related injuries in 2014. Workers involved in maintenance and repair work, janitors and cleaners, and those working in labor, freight, stock, and moving material were at the highest risk. Lacerations occur outside of the workplace as well. Everyday situations, at home or on someone else’s premises, can also lead to physically damaging lacerations. For example, a skin puncture from a dog bite or stepping on a nail can cause an open wound that can become severely infected. What is the value of a laceration injury? This may seem overwhelming but laceration and contusion injury lawyers have the experience to walk you through the process and understand your rights. Bart Bernard assists individuals from across Louisiana who have been injured by contusions, scars and lacerations, helping them understand their rights and the legal process. A personal injury causes physical, emotional, and financial stress for you and your family but you do not need to walk it alone. We are here to answer your questions and help you attain maximum compensation for your claims. At Bart Bernard Personal Injury Firm, we are here to offer you sound and compassionate assistance so that you can fully recover from your laceration injury. Call today for a free confidential consultation. We never charge a fee unless we recover money on your behalf.